Halloween is just a few days away, are you excited? We don't have big plans, I think we will just walk around the neighborhood to see the trick or treaters. But, you know, if we were throwing a party, I feel like I would like something beautiful and glamorous- lots of gold, black and some orange. I loved the painted pumpkin in the picture above, and the black and gold candles in the picture below are easy enough for a DIY.As for the costume, the raven mask in the picture below, inspired me to get a dark and fancy outfit. I would love to wear those Edwardian shoes! As for the costume, the raven mask in the picture below, inspired me to get a dark and fancy outfit. I would love to wear those Edwardian shoes! 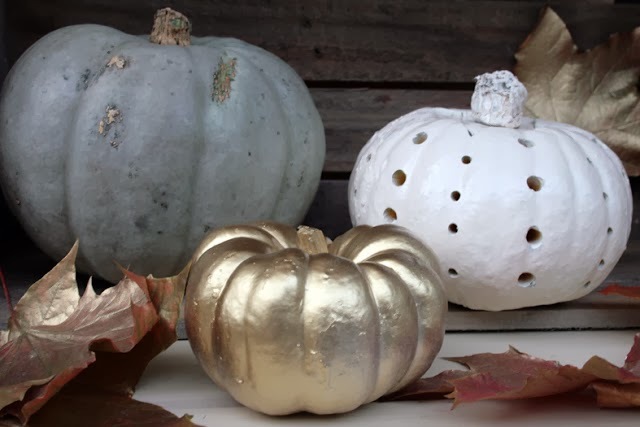 these are some great halloween images - especially love the gold spray painted pumpkin. adorable. Such wonderful finds! Happy Halloween. all of these are such fun ideas! happy halloween! Great Halloween finds, lovely post!